Available in July and August, part farmhouse, part converted barn this house is great for either a relaxed family holiday or more energetic walking, cycling (both road and mountain biking) and outdoor activities. The stunning half timbered entrance hall with its high ceiling is perfect for relaxing on the sofa with a book or for children to play. Off the hall is the sitting room with another couple of sofas, a games cupboard, a variety of toys, laden bookshelves and UK satellite television/ radio. A large kitchen/ diner has fantastic views over the valley towards Arith and is well equipped. I am a keen cook so I hope that you'll find all the gadgets you need as well as a good supply of food basics to help you get settled in. The large table seats 8 comfortably. A back door leads out of the kitchen to a balcony with bench for relaxing while someone else tends the barbecue. Large roof eves make it possible to use the barbecue even if the weather is not perfect. A flight of steps leads down to a large terrace with pergola and outside dining table and benches. The rooms are large and airy with a relaxed comfortable feel. Upstairs is the master bedroom with en-suite bathroom with a heated mirror, heated towel rail, large shower and a bath not to mention the fabulous views. A second double bedroom has a hand crafted bed and both have plenty of hanging and cupboard space as well as hairdryers. A further single room with a high level bed and two more bedrooms, light and airy with a balcony along the front of the house.The hamlet is wonderfully quiet - other than cows passing, traffic is rare and owls are probably the noisiest thing at night! The Massif des Bauges is a well kept secret among the French - really worth discovering. For anyone coming with children we can supply a large range of toys, books, games, DVDs + swings and a trampoline! Nearby attractions and activities available include horse riding, Via Ferrata, Accrobranch, zip wires, caves, castles to visit, vineyards, local markets, award winning local cheese producers, the stunning Gorge du Fier, cycle hire, parapenting and more. There is English satellite television and wifi internet access. There are local supermarkets, vegetable shops, a very respected butcher, award winning dairy and excellent boulangerie for those all important morning croissants and variety of breads. Each village has its own boulangerie and often its own bread oven with an annual festival to celebrate the breads they produce. I live in France with my husband and 3 young boys, we decided to move here in 2002 to satisfy our love of the mountains. We also love the sea and I need regular visits for my ocean "fix"! During the winter I work in our local ski resort, after spending several winter seasons cooking in Val d'Isere I have skiing as one of my top winter passions. Max is a keen cyclist and gets out to ride up hills and cols as much as he can and is always happy to advise on routes - the Tour de France regularly passes this way. We fell in love with this landscape and the many outdoor activities we could enjoy living here. In addition this spot is perfectly peaceful and has great views. This area, the Massif des Bauges has recently been nominated as a national park in France and is outstandingly beautiful. In addition the people are friendly, welcoming and proud of their area and the produce of this region. This house has real "wow" factor when you walk in. It's a special place as it is actually our home and we live here for the rest of the year. This means it's completely equipped for real day to day living with a family. The rural location makes it very safe for young children. We constantly redecorate and revise our ideas to keep the house up to date while remaining a great and unfussy place to be. The en-suite bathroom has a large shower, there is a large bath overlooking the garden and valley, the mirror is heated which prevents it steaming up and the views are great with the added benefit of no one being able to look in on you. There is a heated towel rail, beamed ceiling and inset spot lights. There is a second downstairs bathroom and toilet with shower over the bath, heated towel rail. Hand crafted sink unit and bath add to the finish and feel of this lovely house. Bed linen is provided and the beds will be made up. For people staying a fortnight there is a change in the middle. Various cycles including a hand wash and 30 minute wash, also a large whirlygig type line in the garden. With a bit of luck it will be too sunny and hot to need this. The sitting room is comfy and relaxed with open fireplace and two three seater sofas. There is English satellite television and a selection of CDs,DVDs and videos (TV will play video or DVD). Well stocked bookshelf with wide variety of reading material. Dishwasher tablets, salt and rinse liquid are all supplied. Also we leave hand soap and washing up liquid so you can just get on and not go shopping. There are two fridges, both with freezers so should be no shortage of storage or for chilling wine/ beer. Ice trays are provided. There's a gas hob with 4 burners.No need for matches, it has an ignition system if you turn it a quarter turn and press down. The oven which was new in 2015 is self cleaning - how great is that, sadly you have to do the bars yourself but I'll be sure to leave them sparkling before the summer. Goes ping and heats stuff. A choice of filter coffee machine or one of those bubbly French ones that goes on the stove... up to you. Like many toasters it will either behave perfectly or burn your bread - good luck! We leave tea, coffee, sugar flour etc, you are more than welcome to help yourself to anything that will make your stay more enjoyable. We are a family of 5 and often have 5+ friends here so there are big dishes and plenty of plates, bowls and all that you could need to live well. The kitchen is well equipped with microwave, gas hob, oven, fridge with freezer compartment, kettle, toaster, coffee machine, salad spinner and a good selection of knives which actually cut as well as a food processor. A large table will happily seat 8. Kitchen with wide and large dining table will seat 8 easily, chairs, a bench and extra stools if required. This antique table came all the way from Devon on the roof of a car. Our children range from 9-13 year old boys and are all keen readers to the shelves are well stocked. In addition there's a very eclectic selection of grown up books. A wide range from connect 4, monopoly, jigsaws, cards and much more. Creative, drawing things, lego but I have to say quite strongly boy influenced. swings, run, kick a ball, badminton on a bit of a slope - space and herbs. Outside the kitchen with a nice bench for relaxing in the morning shade or afternoon sun. Gas or charcoal, whatever you prefer. We are really proud of our terrace (I mixed the concrete for it), the honeysuckle growing over the pergola gives a nice bit of shade and the views are awesome, perfect with a barbecue and sunset. During the summer the chair lifts are open at Margeriaz and Les Aillons ski stations to provide access for walkers - about 15 minutes away. There are also many summer activities and events taking place in the other local resorts. There are two 18 holes golf courses on near to Lac d'Annecy (30km). One is in Talloires on the Roc de Chère nature reserve with a panoramic view of Annecy lake and the Château de Menthon and one in Giez facing both lac d'Annecy and Mont Blanc. Notes on accommodation: Towel rails in both bathrooms are electric giving warm aired towels even when the heating is not on in the summer. One of the single bedrooms has a high level bunk with ladder and desk underneath it. There are the usual safety rails around this bed. Outside: The tiled terrace with pergola has a large table with benches and looks over the grassy garden and valley. There are swings and a 4m trampoline with safety net for children and adults alike. Depending on the time of year there may be lettuce, strawberries, raspberries, currants and fresh herbs to help yourself to in the vegetable garden. We have a gas barbeque on the kitchen balcony and the large overhang of the roof makes is possible to barbeque whatever the weather! It's a great place to relax and enjoy the local produce whilst listening to cowbells ringing out over the valley. Utility Room: Washing machine and separate dryer are in the utility room. There's a second fridge with large separate freezer compartment. There's even an iron if you really need one! A rotary clothes line and plenty of pegs are available too. Cleaning / Towels / Linen / Maid service: Linen, bedding and bath towels are provided and changed weekly. Please bring your own beach towels. This is our home and we ask you to treat it well. Please leave the house clean and the cleaner will come and change the beds after your stay. Other: The balcony outside the kitchen has great views over the valley towards Arith - a great evening spot to sit on the bench as the sun goes down and relax with a glass of wine. There's plenty of parking and virtually no traffic. Idyllic setting for enjoyable family holiday. 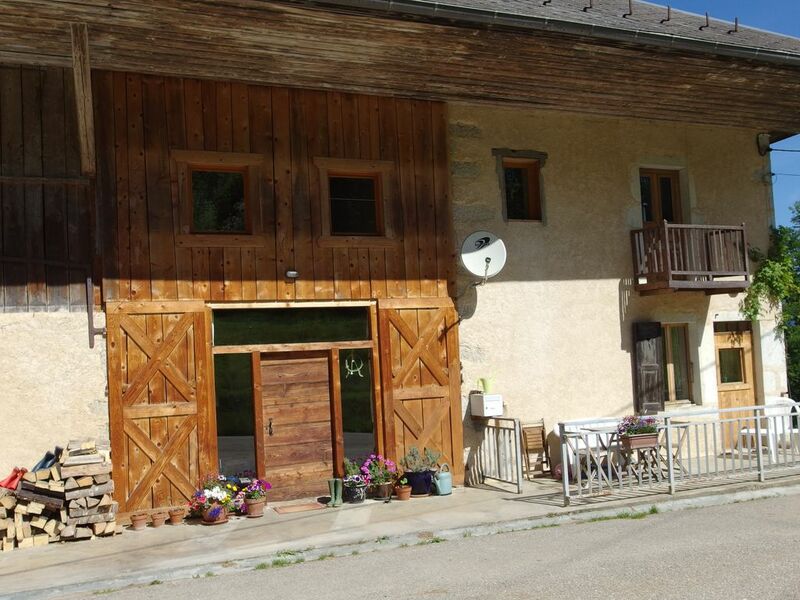 We chose this farmhouse for our holiday because we wanted somewhere with plenty of living space, away from he tourist centre of Annecy, yet within easy reach of the town and the lake. It was perfect for us - an excellent base from which to explore the area on our bikes. Cycling is hard, but the views are stunning, and on our return it was lovely to have the luxury and convenience of two bathrooms and plenty of hot water! The farmhouse was clean and well-equipped. We coldn't think of anything we would need that wasn't available. The owner provided us with a very useful file of information about the house and the local area. We visited the open air swimming pool at Aillon as well as a couple of recommended restaurants - Chez Cyrille and La Barate - both of which served excellent food at very reasonable prices. The house is a short distance from the local dairy (in fact the cows walk past the front door twice a day!) from where fresh milk, butter and local cheese can be perchased. All delicious! The owner was extremely helpful and prompt to reply to all e-mails. I would have no hesitation in recommending this property and would be delighted to return myself. Thank you, we are so pleased that you enjoyed the house and the beautiful area so much. Spectacular location; stunning views; tastefully restored farmhouse with unique original features and homely welcome giving a perfect and spacious holiday base from which to explore the Savoie Alps. So much to explore we plan to make a return visit! Highly recommend. There is a leisure lake in Lescheraines 5 mins drive where you can swim, picnic and enjoy a waterslide, a handy local spot with children. An accrobranch course of wires in the trees and trampolines are also set up. Annecy lake has a wealth of beaches and swimming areas/ diving platforms as does the Lac de Bourget at Aix les Bains. The outdoor pool at Aillons is a 15 minute drive and situated in the midst of the mountains, you can swim to the sound of cowbells! One of my favourites. Geneva airport is just one under an hour away with a very easy drive. Lyons and Grenoble are approx 1.5 hours away and Chambery is just 40 minutes. You really need a car to explore this region. The drive from Calais is approximately 8-9 hours for anyone wishing to drive. Directions can be supplied. By driving approx 35 minutes you can reach the towns of Annecy, Chambery or Aix les Bains. There are castles to explore, chair lifts are open in the summer giving access to views and easy walking, grass sledging, riding and wine/cheese tasting are just a few of the things you can enjoy locally. There are supermarkets both in Lescheraines (5 mins) and also in Le Chatelard (15 mins). We have a local weekly market and Annecy market is a great source of local produce. Lescheraines has a small supermarket, excellent butchers, a weekly market of local produce and several restaurants/ bars and a great boulangerie. A newly opened slightly larger Carrefour supermarket at Chatelard is only 15 minutes away. There are also cashpoint machines, post offices and tourist information in both Lescheraines and Chatelard. Highly recommended are the Cooperative Laiterie (just down the road from the house) supplying fresh milk and award winning cheeses, the Mont Pelat restaurant at Aillons for great local foods or a trip up to admire stunning views at Le Revard - also with a good restaurant at the top. Booking Notes: Bookings can be made by phone or e-mail. A 20% deposit must be made when booking, the balance is due no later than 6 weeks before the start of the holiday. I will do my best to accommodate any requests. A £100 security deposit is required with the booking and will be refunded within a week after the holiday. The house will be available from 3pm on arrival day and should be vacated by 11am on departure please. The house must be left clean and in good order. Strictly no smoking in the house. No pets. Deductions from the security deposit will only be made for breakages/ damage or if the house is left in such a condition that additional cleaning is required. Changeover Day: Saturday is the normal changover day but I will do my best to accommodate any special requests. Please do not hesitate to contact me. Notes on prices: Prices are for the property per week in UK pounds.